If you ever get the chance to visit historic Santa Fe, you must visit the La Fonda Hotel – not only is it as beautiful as Santa Fe, it is home to some western ghosts. 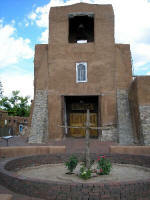 When Santa Fe was founded in 1607, records show that an inn, or la fonda, on this location was one of the first businesses established. 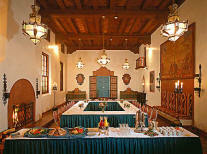 It is believed that court was held in the original adobe inn, as well as executions - guilty offenders were hanged in the lobby! There is a particular ghost, as the legend goes, who was a salesman who lost all of his company’s money in a card game. So distraught, he leapt to his death down a deep well. This well is directly under the La Fonda's dining room, La Plazuela (left). Both guests and staff have reported the sight of a ghostly figure that walks to the center of the room, then seemingly jumps into the floor and disappears. Another interesting story dates back to the 1970s. A guest reportedly called the front desk to complain that someone was roaming the hallway in front of his room. When an employee was sent to investigate, he saw a tall man in a long, black coat disappear into a stairwell. However, when he followed him to the stairs, there was no sign of the mysterious man in black. 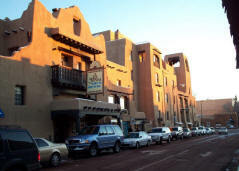 Other reported sighting includes an apparition that haunts the Santa Fe Room (right) , as well as a spirit that walks the hallways near the La Terraza, a restaurant located on the east side of the hotel's third floor floor.